Handmade Gift and Shopping Guide | The Meandering Musings of a Consummate Shopper Handmade Shopping Guide: Temari? Do you know what Temari is? Me neither. At least not until I ran across today's feature shop and became both fascinated and enchanted by the gorgeous works of art that I found there. Temari is a thousand year old craft that originated in China and was then introduced to Japan about five or six centuries ago. According to Wikipedia, temari were historically constructed from the remnants of old kimonos. Pieces of silk fabric would be wadded up to form a ball, and then the wad would be wrapped with strips of fabric. As time passed, traditional temari became an art, with the functional stitching becoming more decorative and detailed, until the balls displayed intricate embroidery. Julie and Co.'s shop is filled with these beautiful, intricate pieces of art that are both fascinating to behold and stimulating to the senses. They're absolutely gorgeous and I can't even imagine the amount of work it takes to make one, let alone the huge variety of them that Julie and Co. has to offer in their shop. TO VISIT JULIEANDCO'S SHOP YOU CAN CLICK THE PICTURE ABOVE OR, IF YOU'D RATHER, CLICK RIGHT HERE! Aren't those just beautiful??? I have seen those on ETsy before and am just amazed at the detail!! I'm like you - I can't even imagine all the hours of work that goes into one ball!! Great feature! 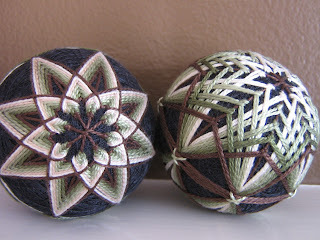 ive seen temari balls before and still find them an incredible art form. beautiful, i agree with duckie, it must take forever to make one! beautiful results tho! I've never come across this before! Thanks - they are just beautiful!